What's Crawling In Your Crawl Space? Previous animal infestation, mold and mildew growth, as well as large amounts of dust can all result in your crawl space becoming a wet, smelly, and unhealthy place. If you're in need of a thorough cleaning job of this area, rest assured our technicians possess the necessary equipment and knowledge to tackle even the dirtiest jobs. What you'll end up with is a pristine environment that will go a long way in keeping the indoor air quality of your home optimal while reducing the energy you waste every month. The air that gets circulated throughout your home does so in a continuous circle. This so-called 'stack effect' means that the same air re-visits the crawl space area multiple times in a single day. Now, if your home has mold, mildew or infestation problem, you are running the risk of breathing the same, contaminated air of very poor quality. By hiring our professional cleanup crew, you will soon enjoy a noticeably fresher and healthier air as it won't have to pass through the piles of filth on its way to your lungs. 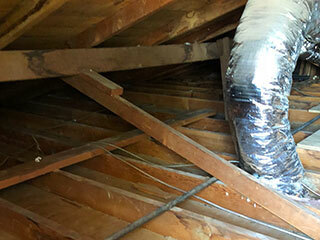 Your crawl space can quickly become an unhealthy environment if rodents start nesting down there. The vermin's ability to wreak havoc by chewing on insulation and wires can set you back for a fair amount of money. Therefore, make sure that after your rodent problem has been addressed, you hire a team of professionals to competently clean up the area and seal all points of entry so that your home remains healthy and rodent-free. Can This be a DIY Job? Not only is the area dark, dirty and in some cases full of chewed-up wires and damaged insulation, but there are also dangers of pests and animals trying to protect their newly-nested homes down there. With that being said, it's best practice to leave this job to a trained professional at Attic Cleaning Hayward as we’ll have the right tools and protective gear to address the problem.